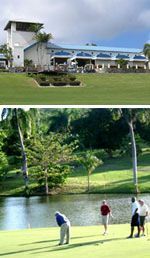 The par-72 Carambola golf course was built by Laurence Rockefeller as the centerpiece of a luxury Caribbean resort complex. Designed by Robert Trent Jones Sr., one of the most highly respected designers of the 20th century, Carambola opened in 1966 to rave reviews and was considered by the master designer himself to be one of his finest courses. Winding through a lush, tropical valley on the northwest side of the island of St. Croix in the US Virgin Islands, the Carambola Golf & Country Club is truly one of the great treasures of American golf and the finest course in the Virgin Islands. This challenging, spectacular Trent Jones signature course is a Caribbean gem and a "must play" for any true lover of the game of golf. Carambola has received a four star rating from GOLF Magazine. Come to enjoy a perfect Caribbean golf vacation and stay to enjoy the unspoiled, picturesque and private island of St. Croix. You will fall in love with the Carambola Golf & Country Club and with its beautiful island home.